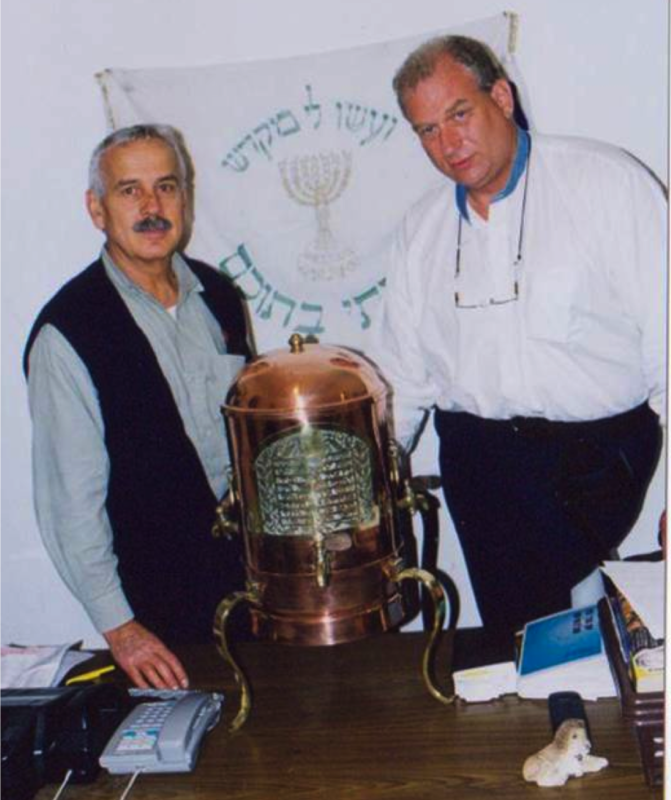 Gershon Salomon, founder of the Temple Mount Faithful in Jerusalem discusses a lavender with Dr. Bill that has been prepared for possible use in the Third Temple. 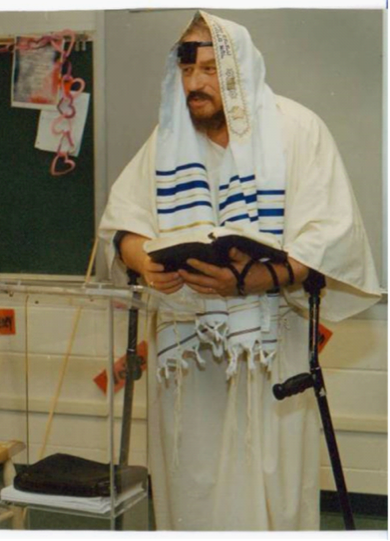 Fall, 1998. 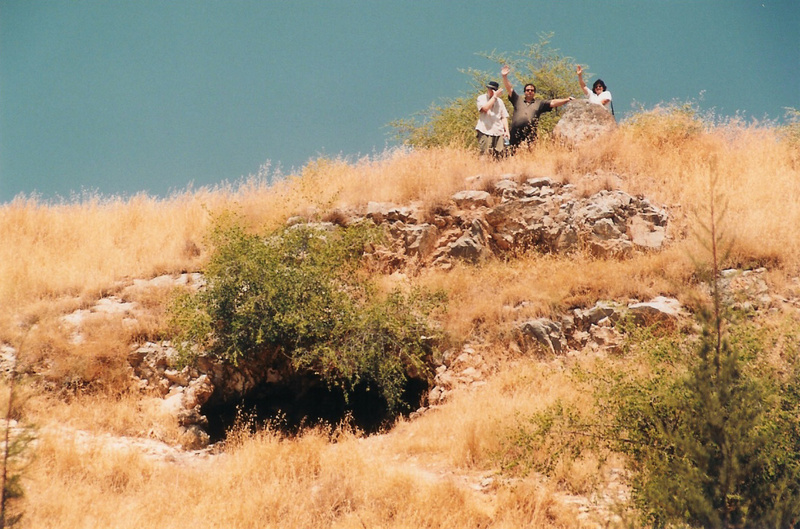 The overgrown ruins of an ancient village as seen in 1998 was suspected to be Magdala, the home of Mary Magdaline. 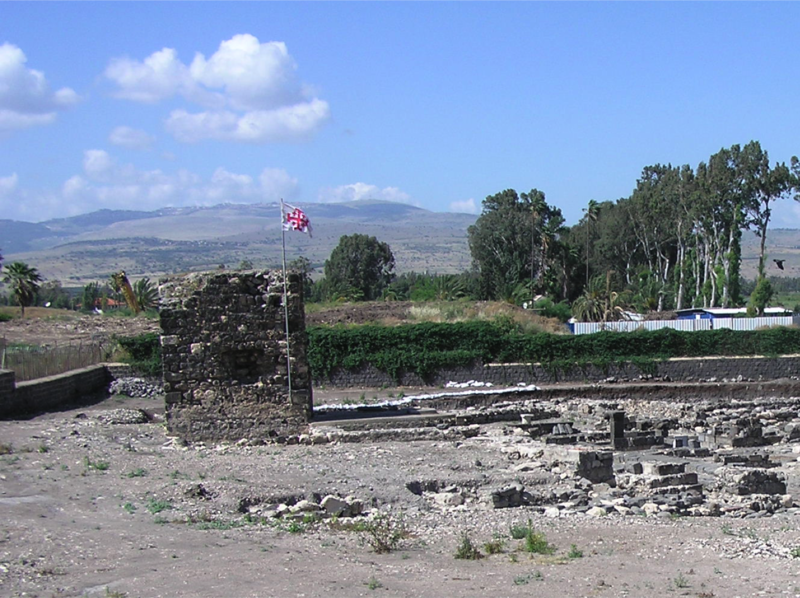 In 2010 archaeologists confirmed this ancient ruined village to be Magdala. 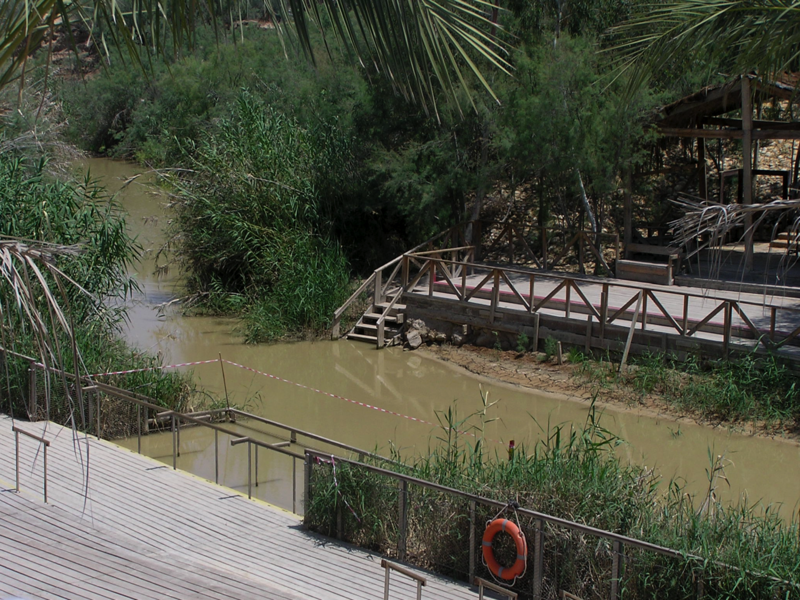 The place where John the Baptist is said to have baptized Jesus is slightly above the upper end of the Dead Sea. 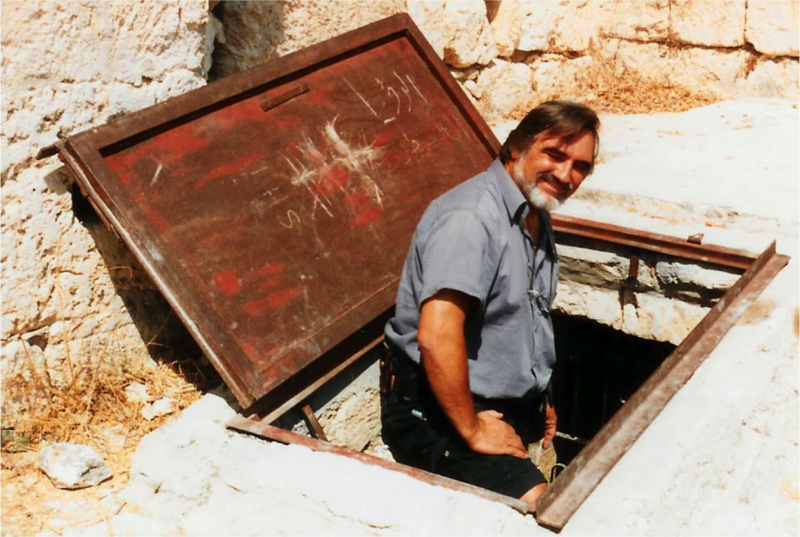 When Jesus said that a city set on the top of a hill cannot be hidden (Mt. 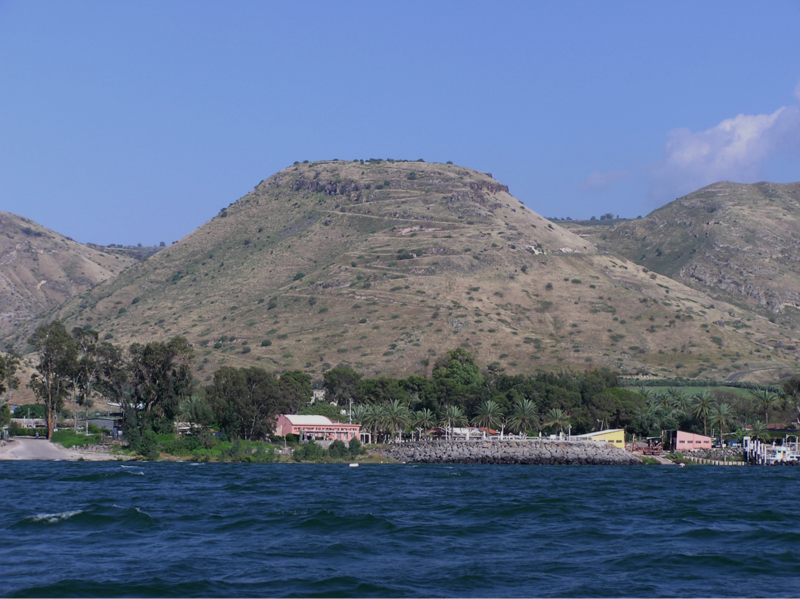 5:14), He probably meant Hippos located upon this mountain on the eastern side of the Sea of Galilee as it was the only city on a hill. 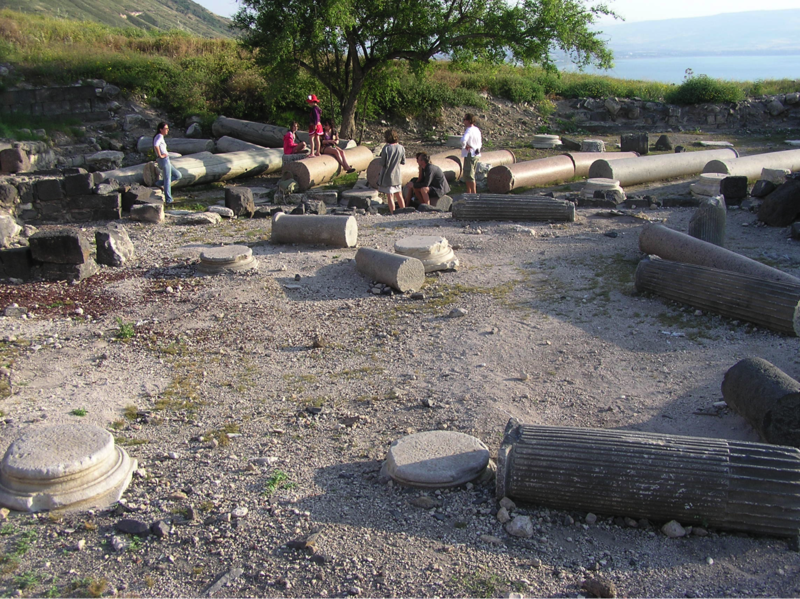 Columns of the ruined city of Hippos lay everywhere and the Sea of Galilee is in the background. 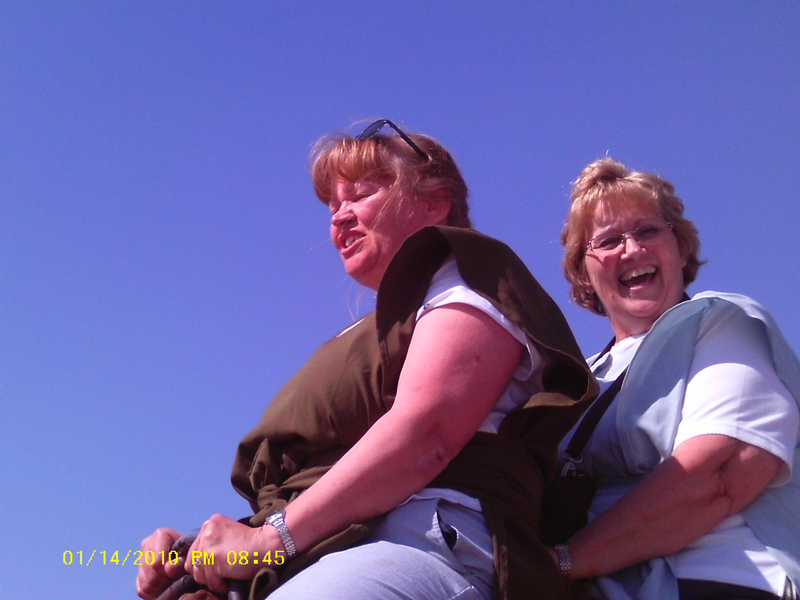 It was a rough climb but was well worth the effort (2011). 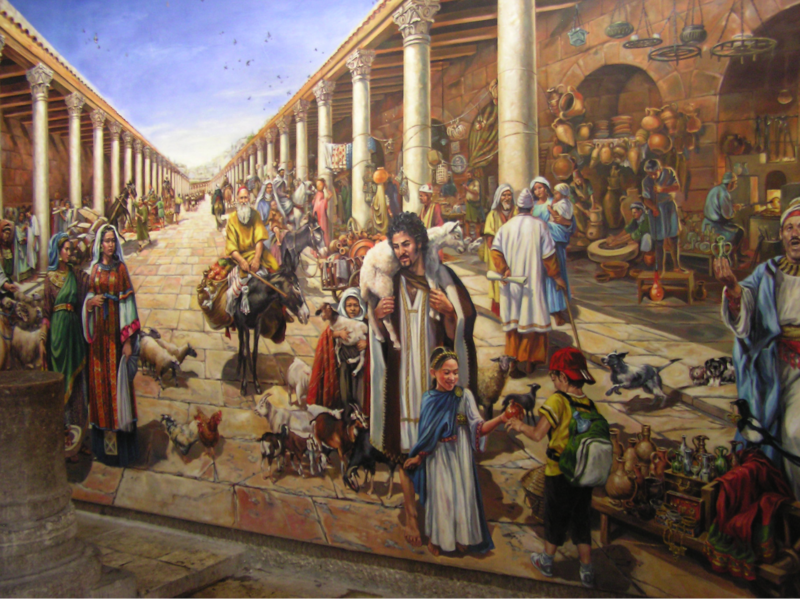 A typical market scene along “The Cardo Maximus” in Jerusalem in the first and second century. 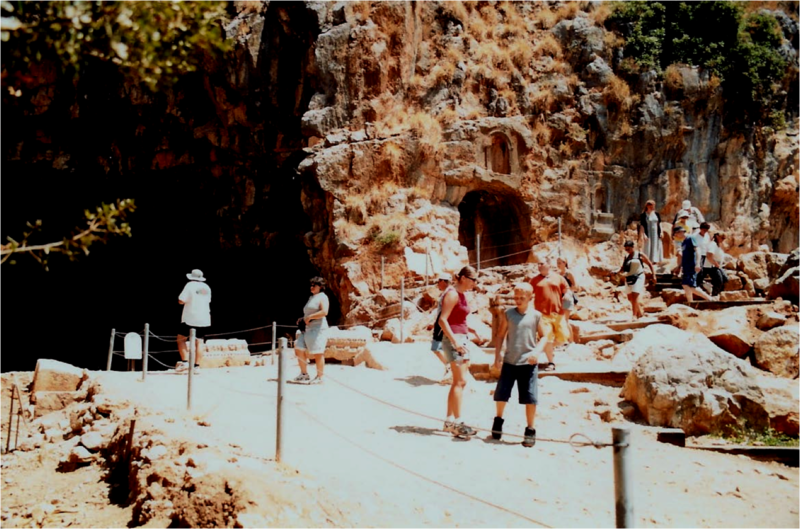 Near Nazareth was the city of Sepphoris where scholars believe Jesus and Joseph sold their handcrafted wares in a shop as shown above. 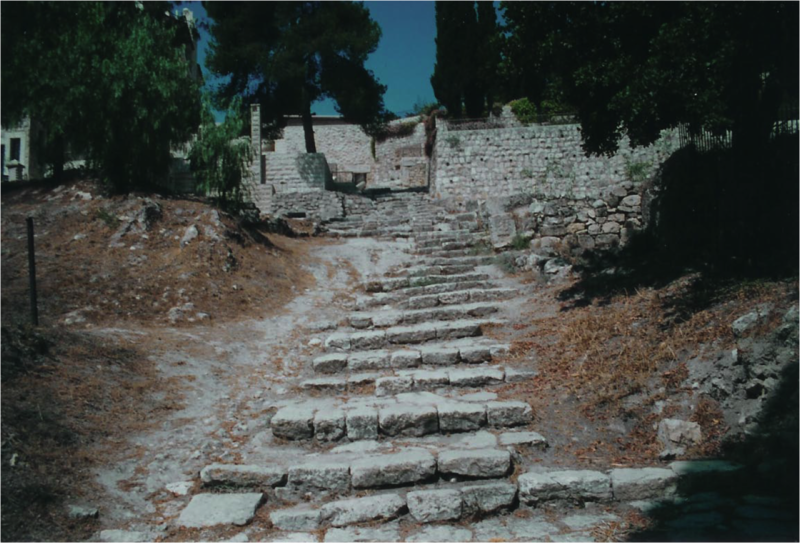 The worn path that leads up the hill, to what was the home of Caiaphas, is where Jesus walked before His crucifixion. 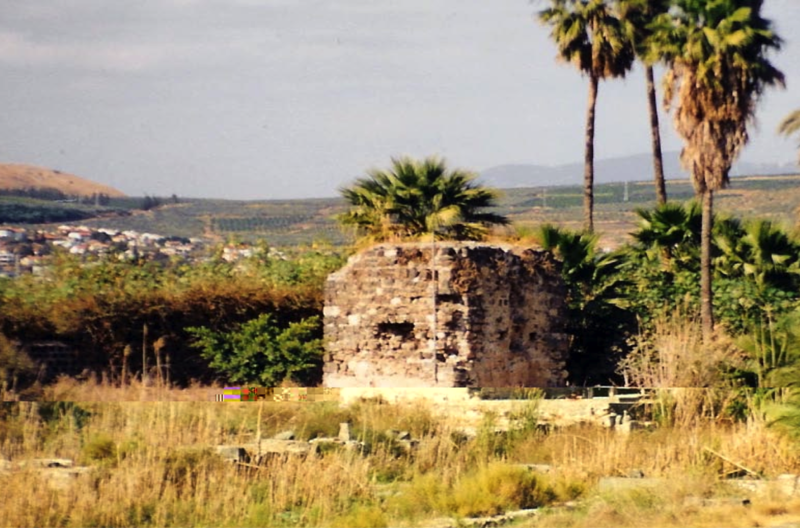 You will learn why a 4th century pilgrim-tourist wrote that this hill top, located along the edge of the Sea of Galilee and the Via Maris, is the site where Jesus taught the Sermon on the Mount. 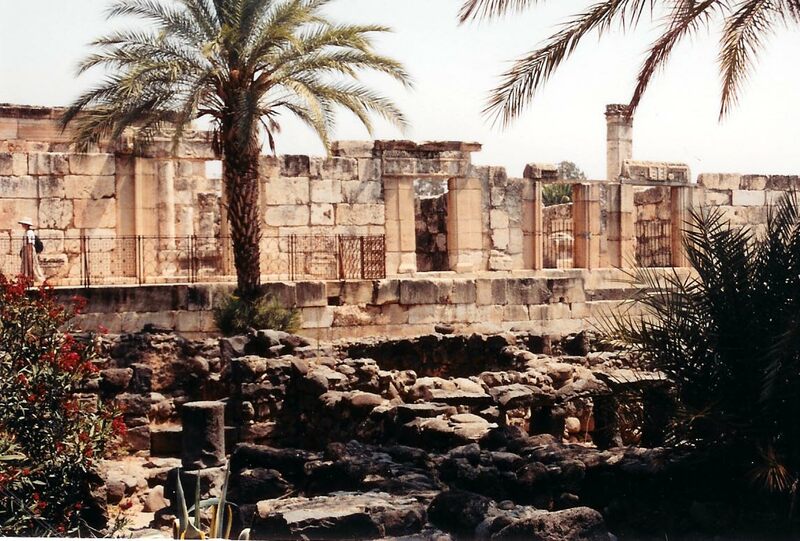 The reconstructed 4th century Capernaum synagogue rests upon the foundation of the synagogue where Jesus taught. 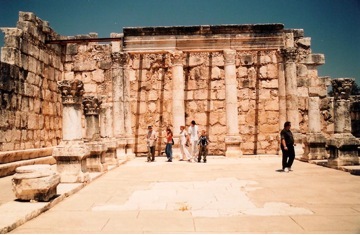 Visitors walk through the Capernaum synagogue. 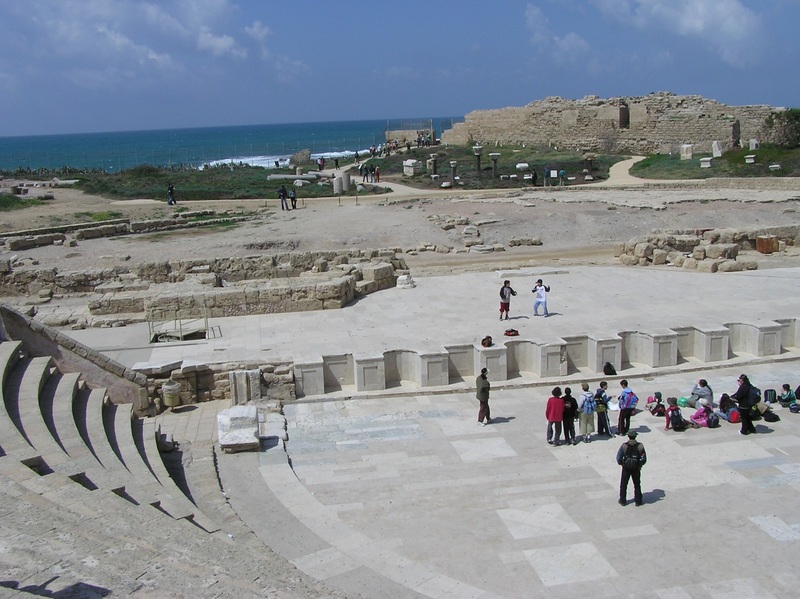 The original synagogue where Jesus taught was destroyed, but it was rebuilt on the same site in the early 4th century. 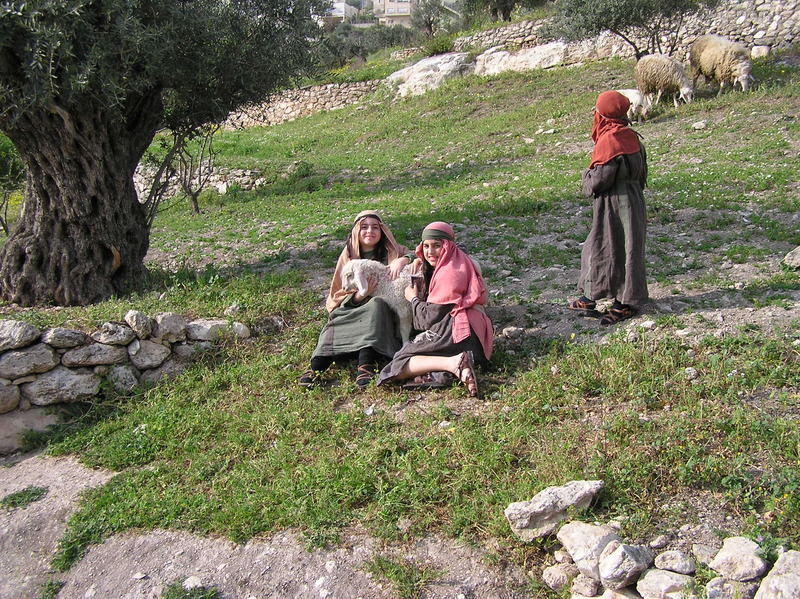 At the reconstructed 1st century Nazareth Village visitors see how Jesus lived during His years prior to His ministry. 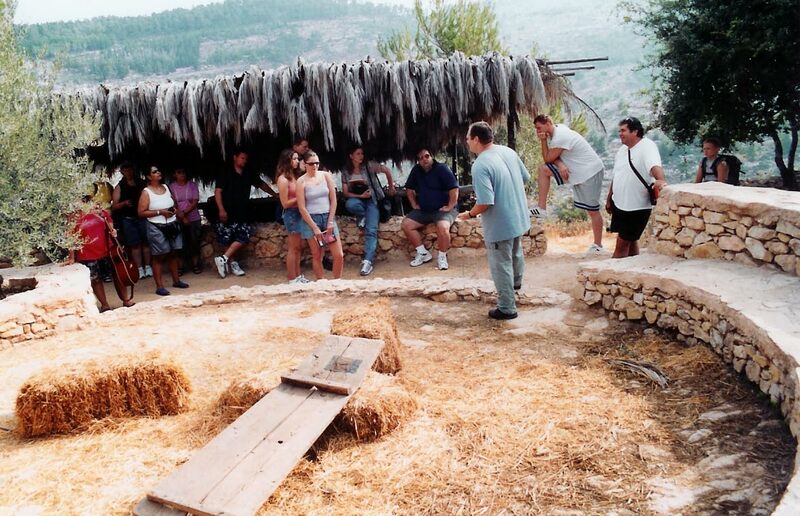 All buildings, garments, tools and other elements of the Village have been authentically reproduced. 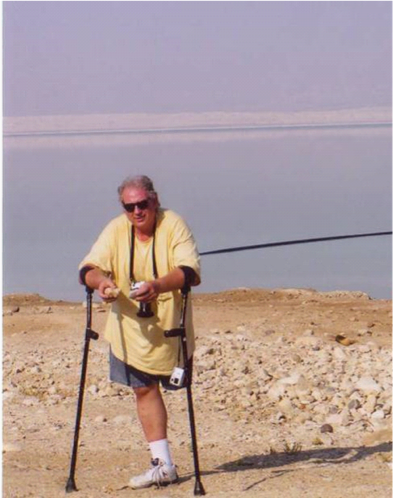 When you visit the Bay of Parables at the northwestern end of the Sea of Galilee, you will understand how Jesus could have spoken to thousands from a boat with everyone hearing Him. 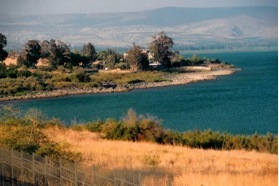 The hillside around the Bay is a natural amphitheater. 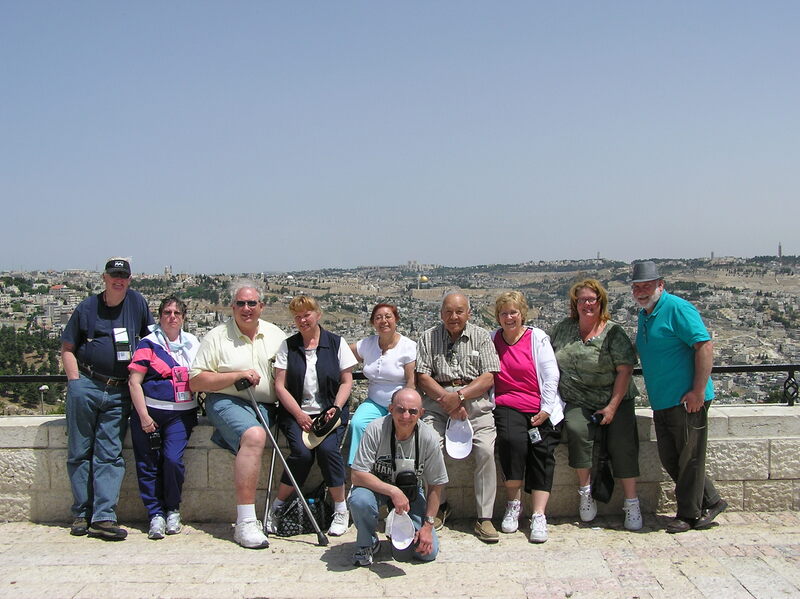 Make sure you don’t get disjointed by too much walking in Jerusalem. 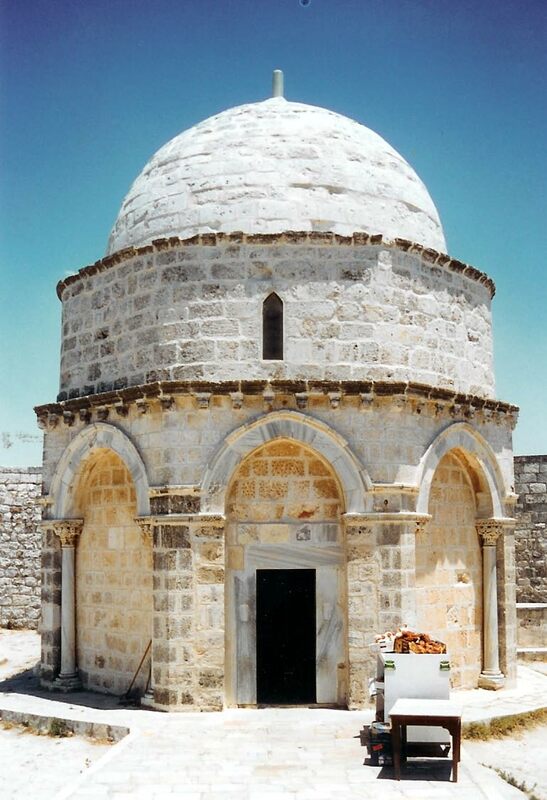 For many years a small mosque has stood over the rock on the Mount of Olives from where traditions say Jesus ascended into Heaven. 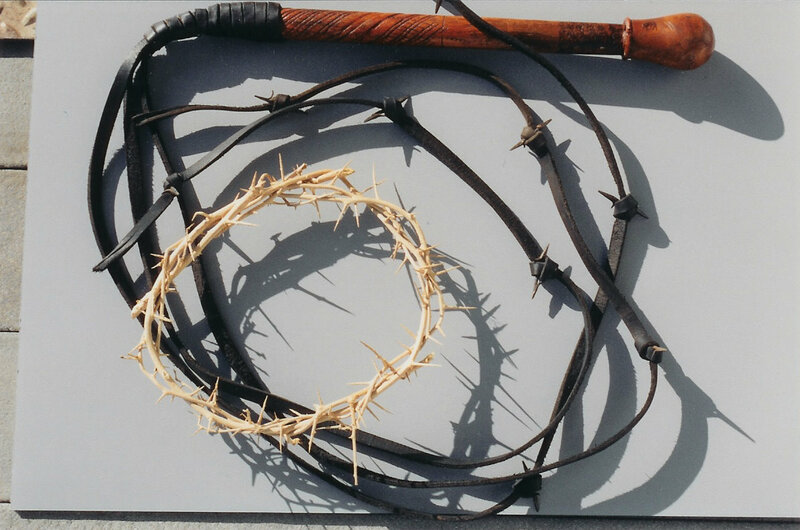 A re-created flogging whip and crown of thorns is similar to what Jesus may have experienced. 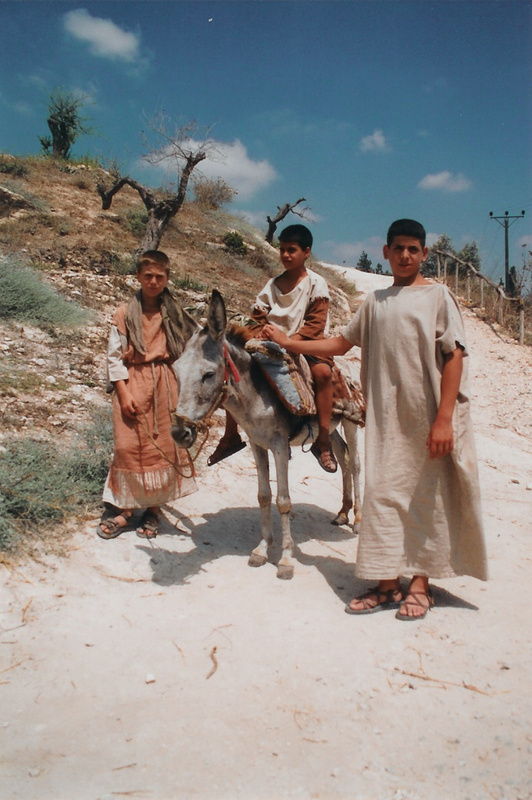 Two boys are dressed in authentic costume who normally perform various tasks at the re-created 1st century Nazareth Village, pose for this picture. 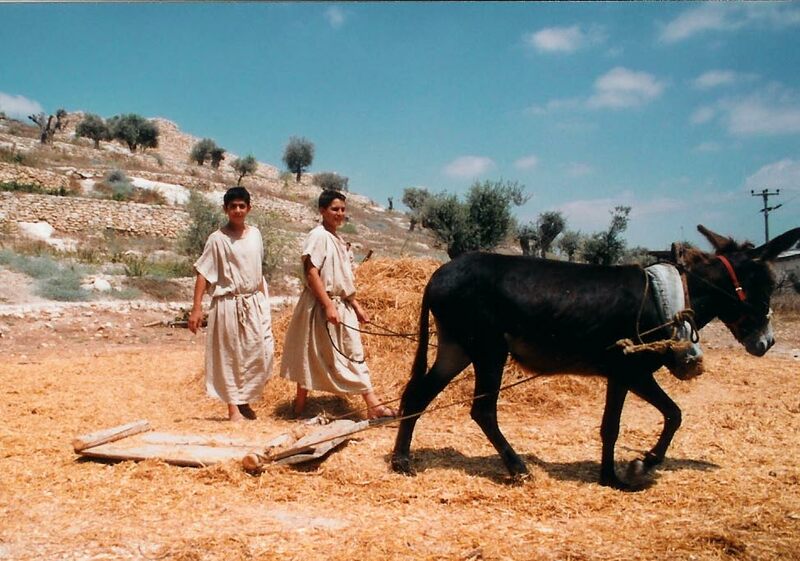 Two boys with a threshing sled. 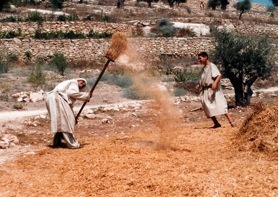 The threshing sled separated the wheat from its outer protective covering. 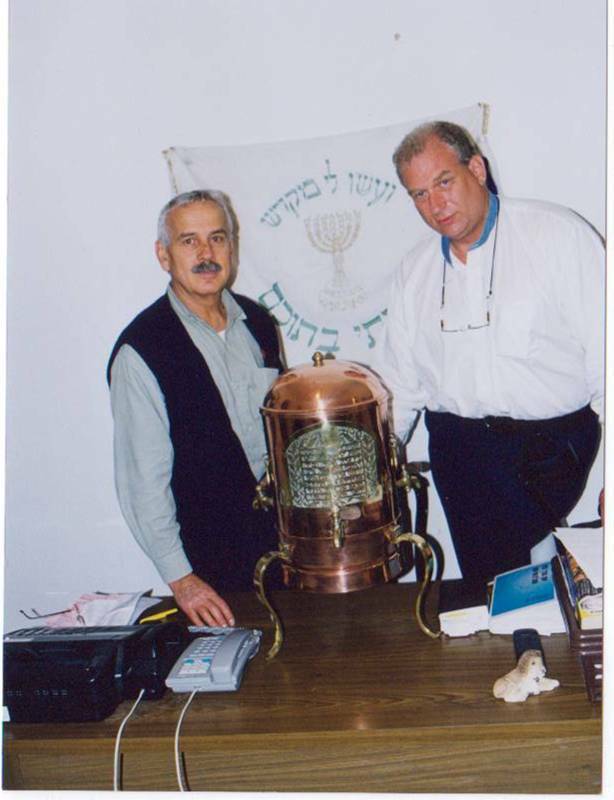 In 2004 our group was at Qumran when we saw Archaeologist Randal Price uncovered a large clay jug that he believed was dated to 31BC. 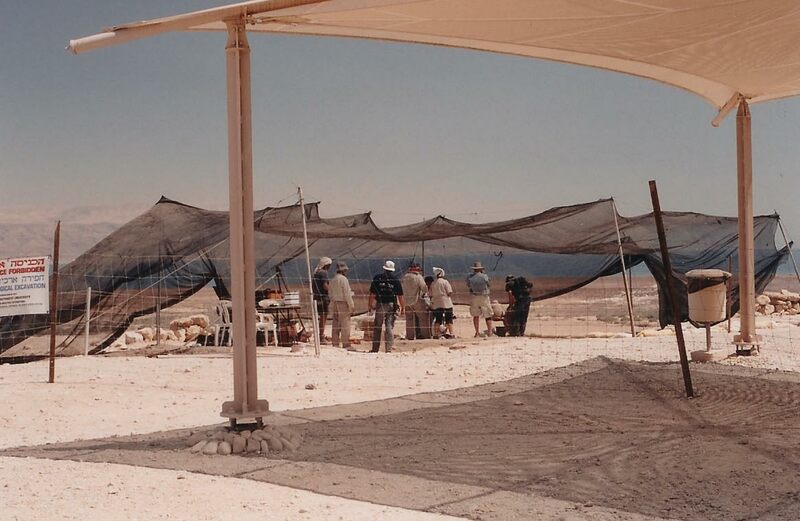 It was empty, but in rare perfect condition. 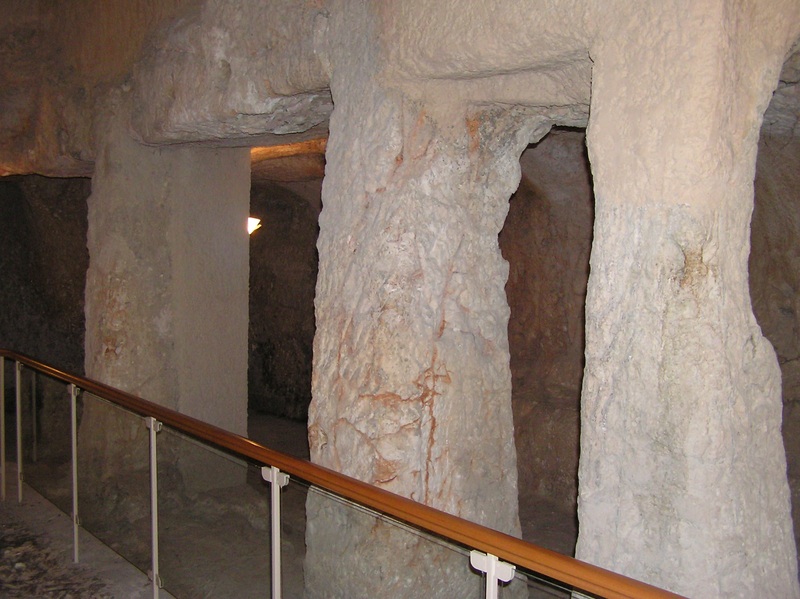 Later tests, such as neutron activation analysis, revealed that the jug was made from clay identical to clay in Jerusalem, and that it contained wine. 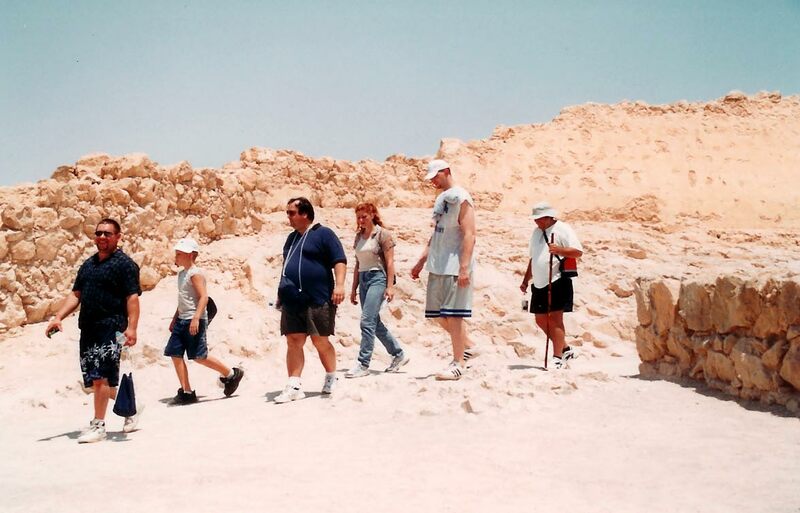 Qumran is the site where the famous Dead Sea Scrolls were discovered in eleven mountain caves. 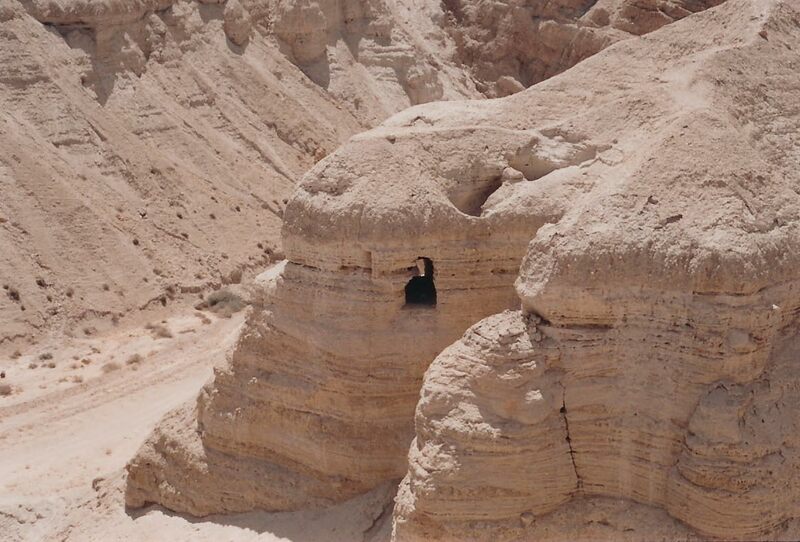 This cave is one of eleven caves in which the Dead Sea Scrolls were discovered. 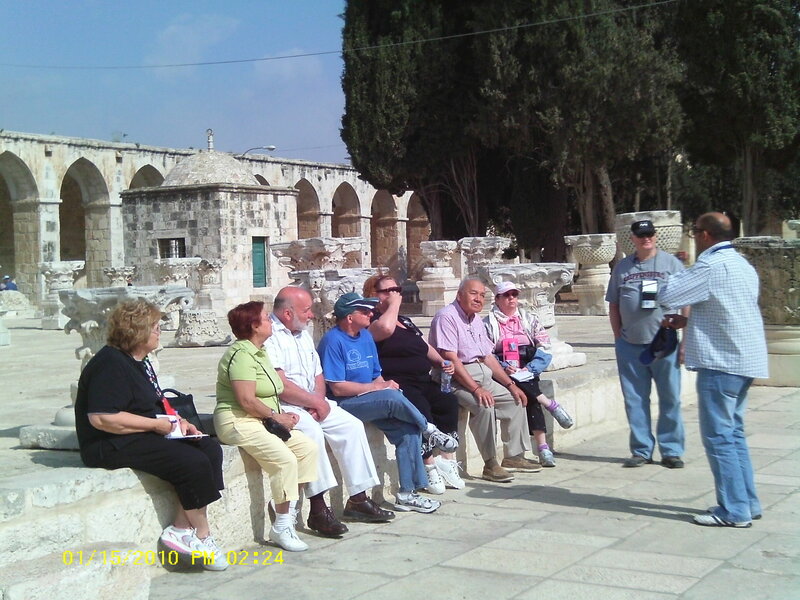 Paivi explains the work she did and where she lived in the Old City during her ten years of volunteer work to Holocaust victims and the elderly in Jerusalem. 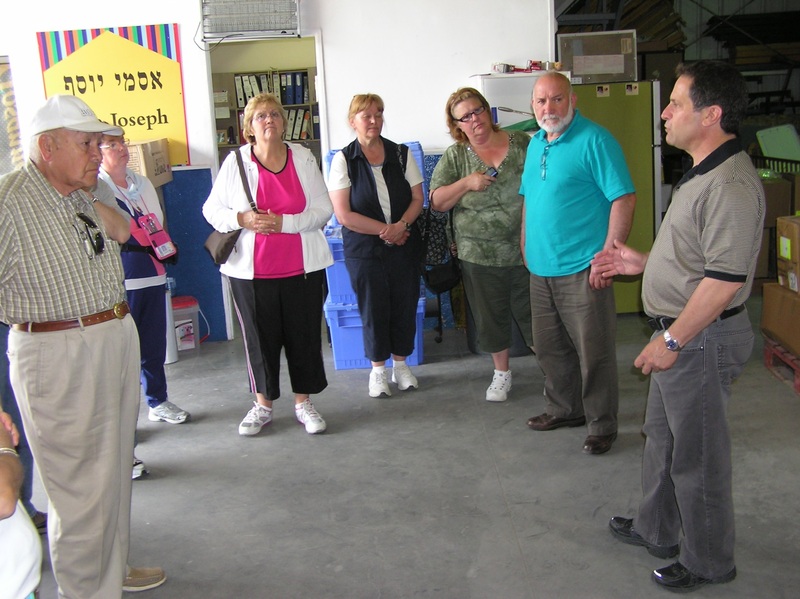 Barry Segel (right) explains the ministry of Joseph’s Storehouse and Vision for Israel. 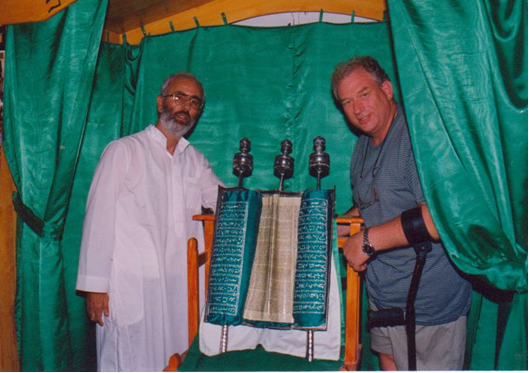 They touch countless lives, both Jews and Arabs, with the love of Jesus. 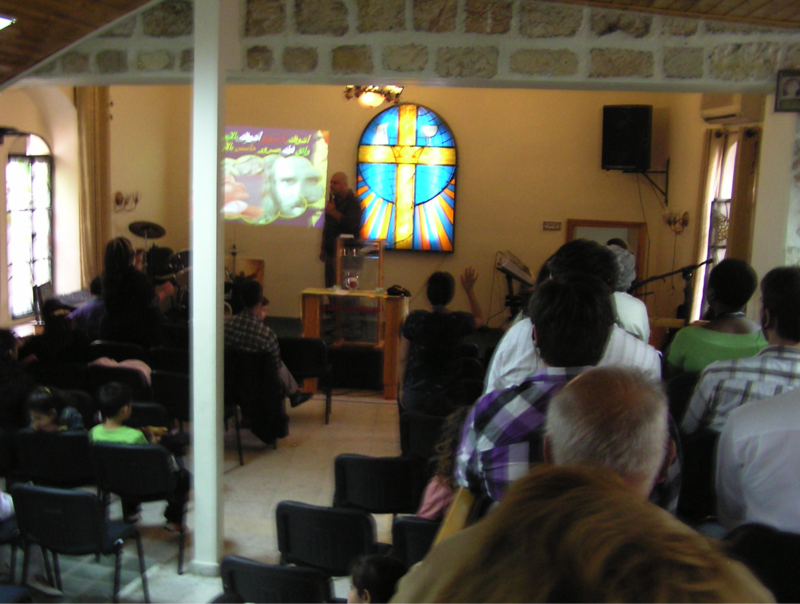 We visited an Arab church where believers gather to praise our Jesus. 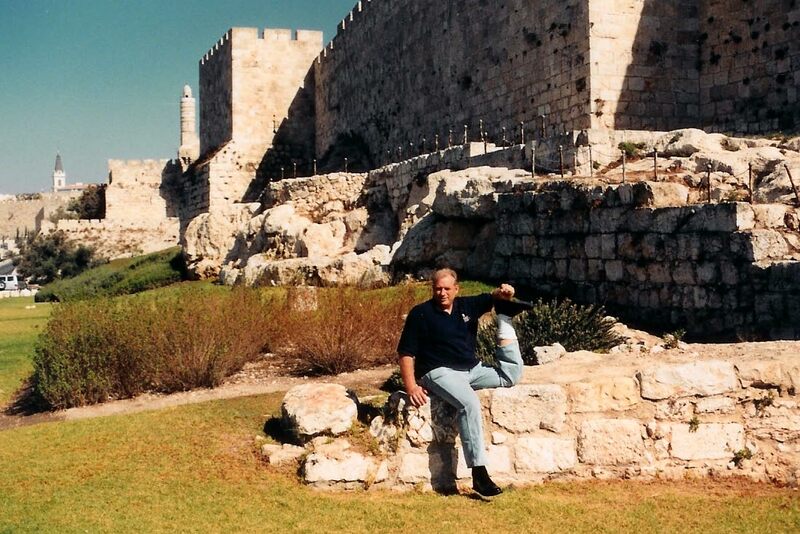 Continue to pray for the peace of Jerusalem (Ps. 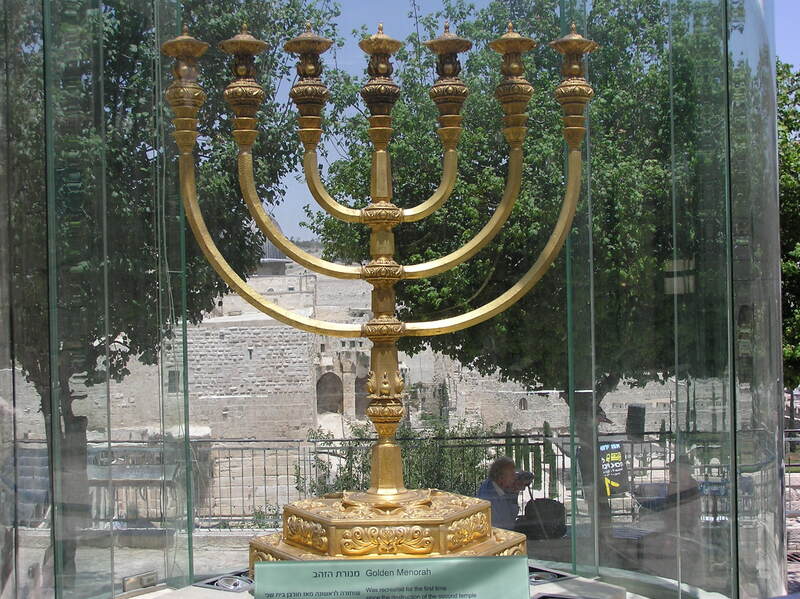 122:6) and that more will come to know Him as Lord and Savior. 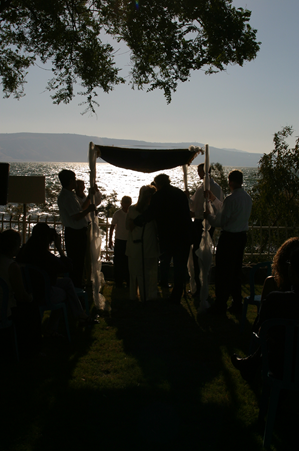 You will bring home many memorable moments such as floating in the Dead Sea. Sometimes we go to unique places. 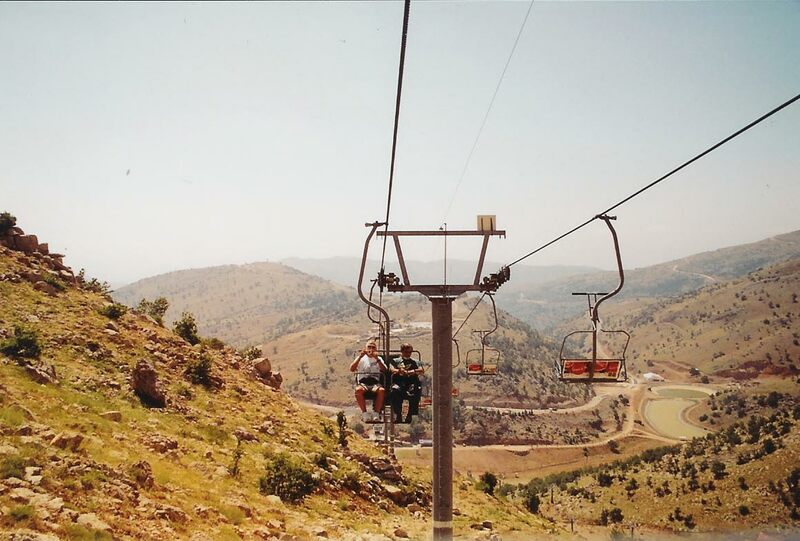 Here tour guide Arie Bar David (right), rides with one of our guests as the group travels up Mount Hermon on a ski lift. 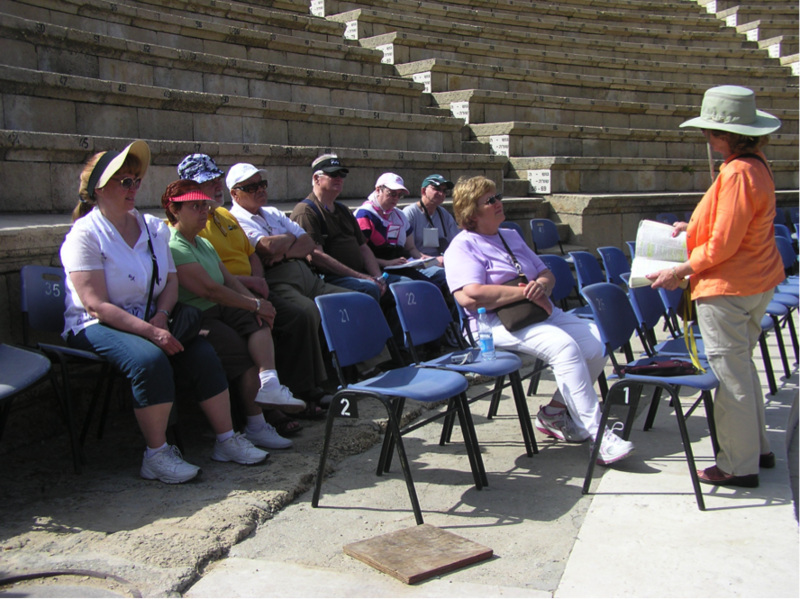 Unfortunately, we didn’t find much snow in the summer, but we had a fantastic view of northern Israel, Syria and Lebanon. .
Paivi Heinrich explains to the tour group where she lived along “The Cardo” in Old Jerusalem. 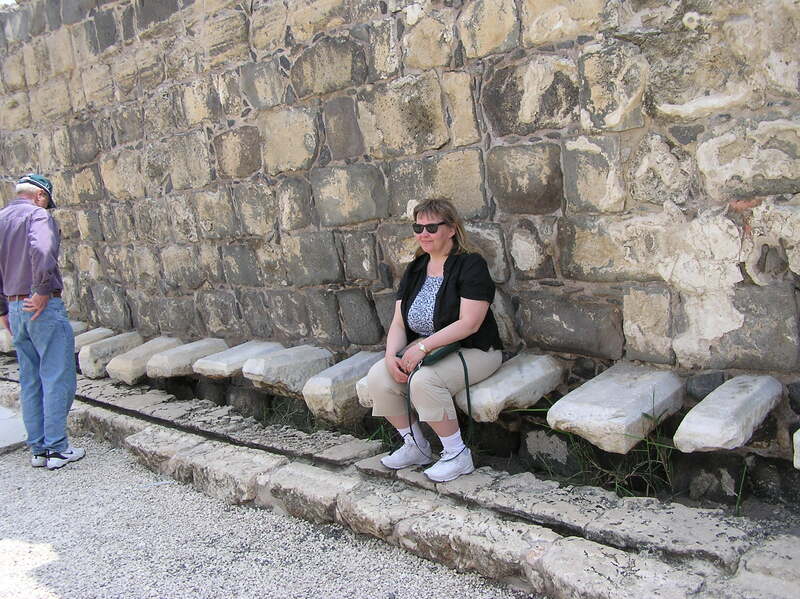 It was one of several places where she lived during her ten years in Jerusalem. 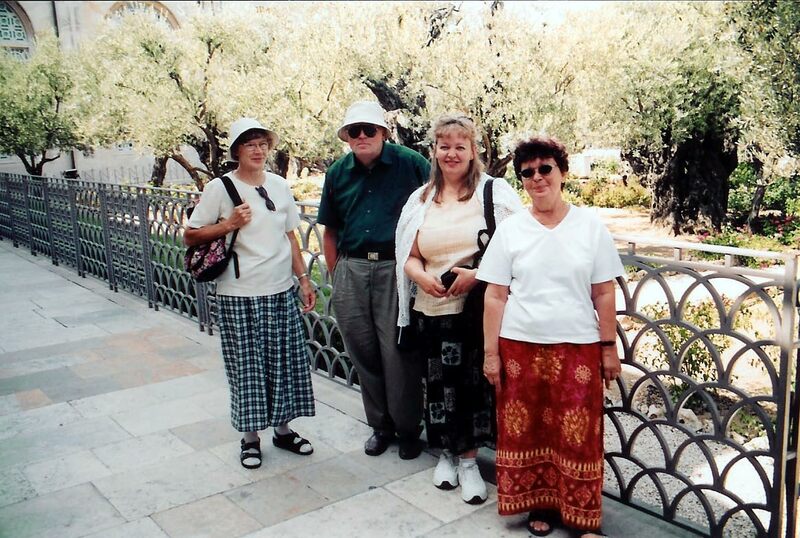 Paivi with her mother (right side) and friends from Finland in the Garden of Gethsemane. 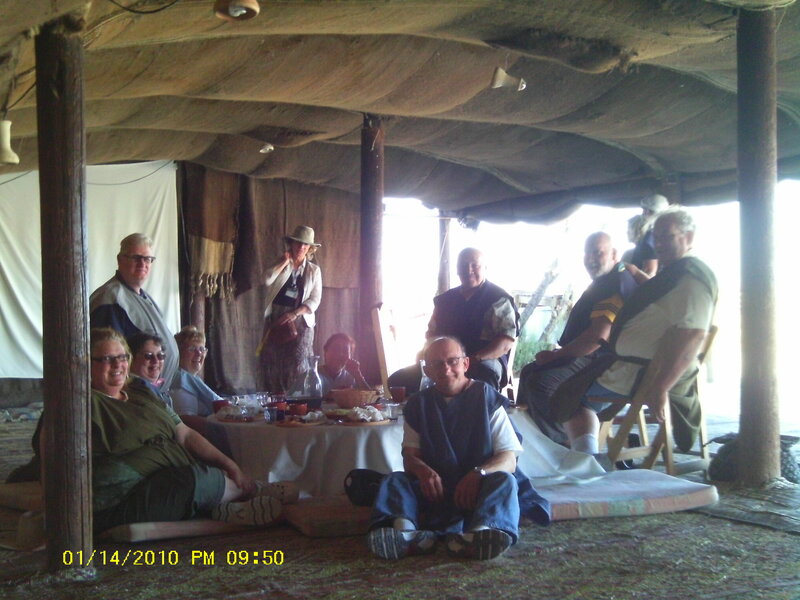 Our group is seated by a first century threshing floor as our tour guide, Eretz, explains its connection to the biblical teachings. 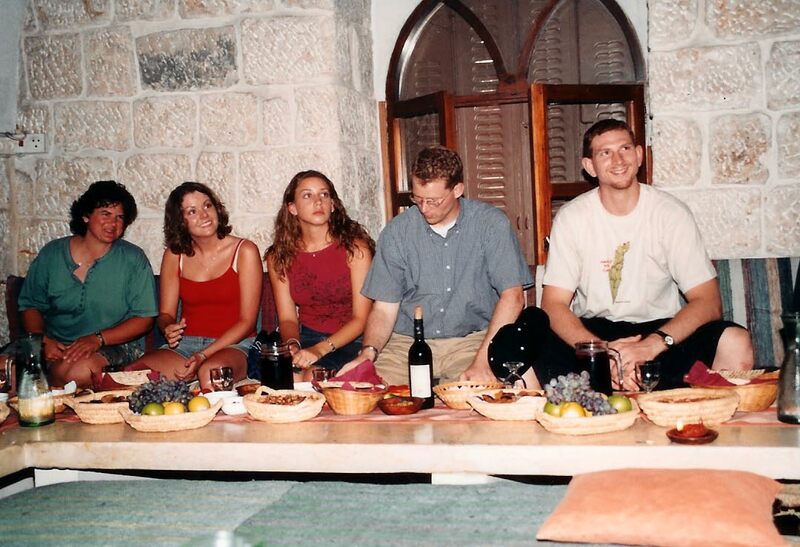 To experience the Last Supper, our guests are seated at a Triclinium — a low “U”-shaped table. 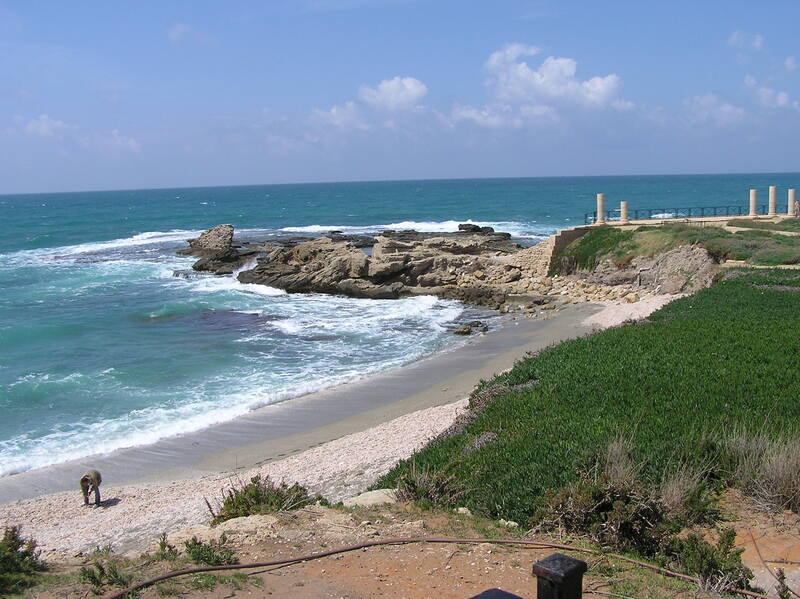 In this setting, the actions and words of Jesus to John and Judas demonstrate His deep love and concern for them. 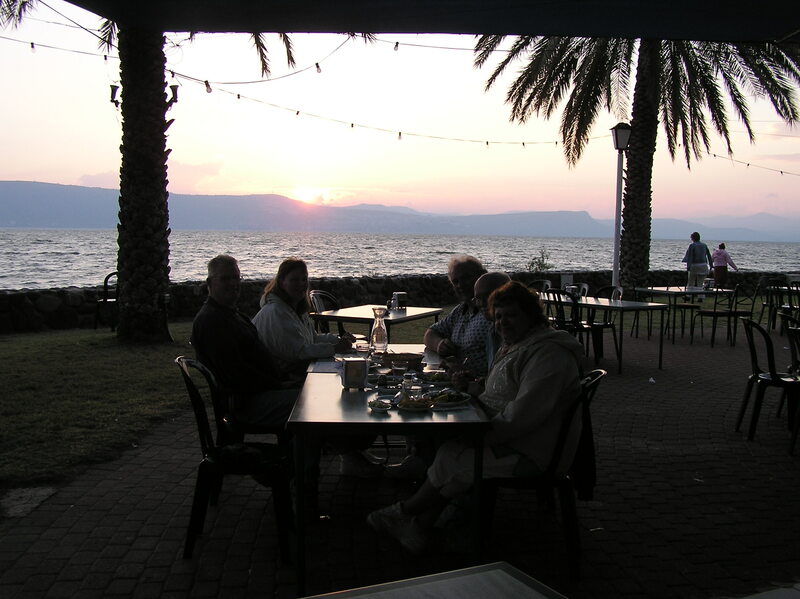 When you arrive in Israel, it is refreshing to relax by the Mediterranean or the Sea of Galilee. 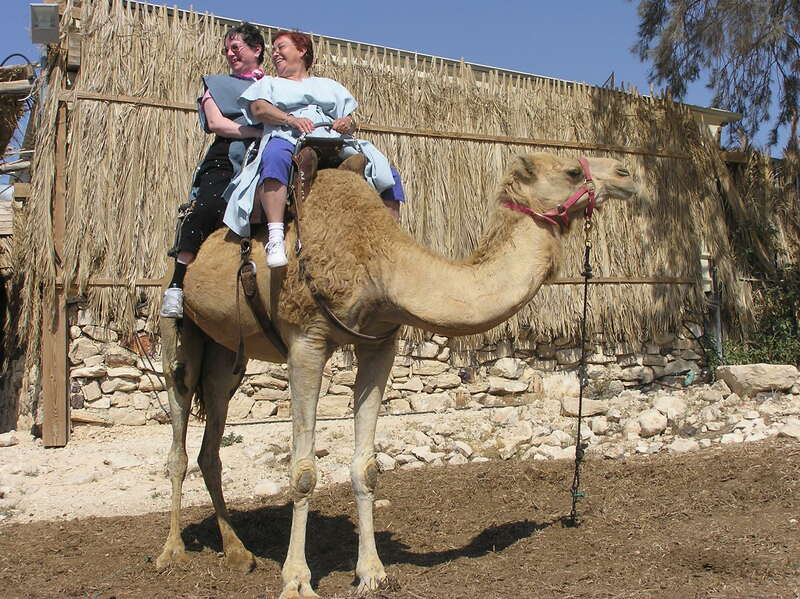 Yes, sweethearts are permitted to travel with us. 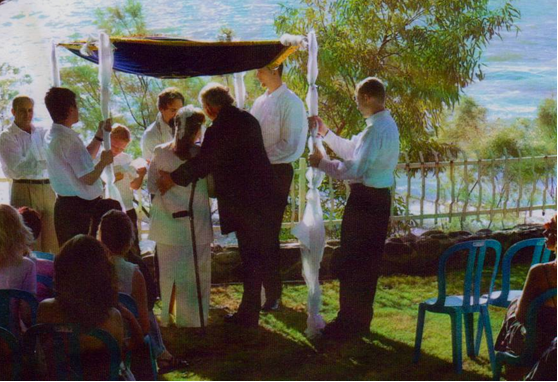 In 2004 Rev. 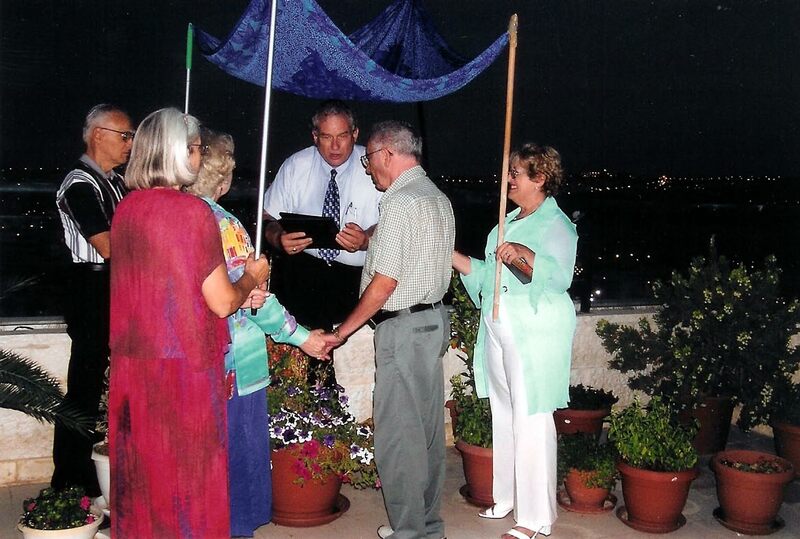 Bill performed a wedding for two special friends in Jerusalem. 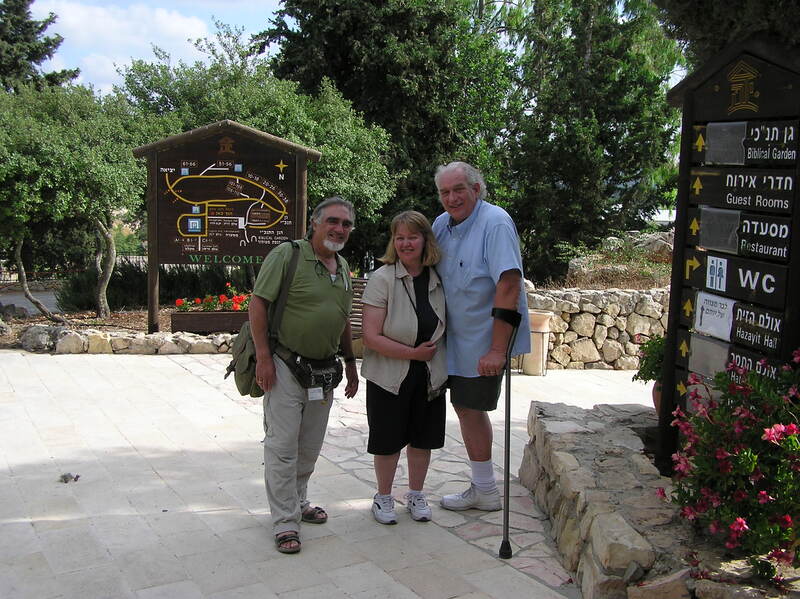 We will see some of Israel’s historic battle sites. 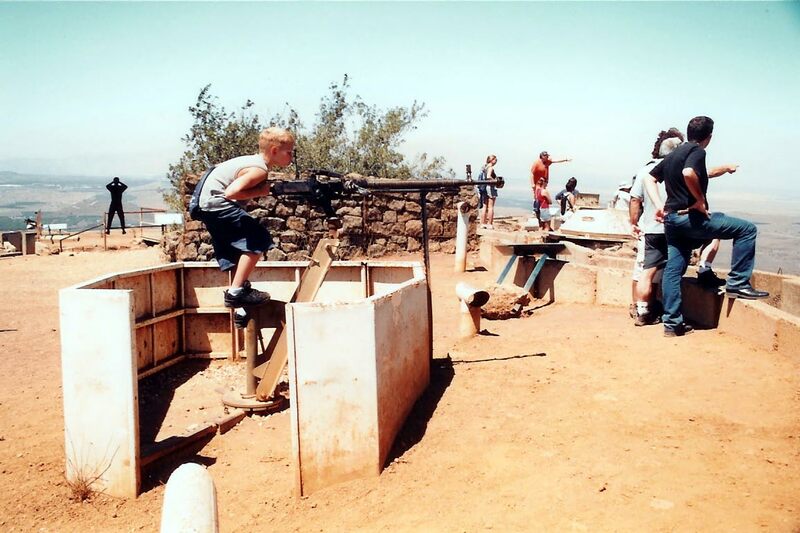 In this picture, we are on the Golan overlooking Syria. 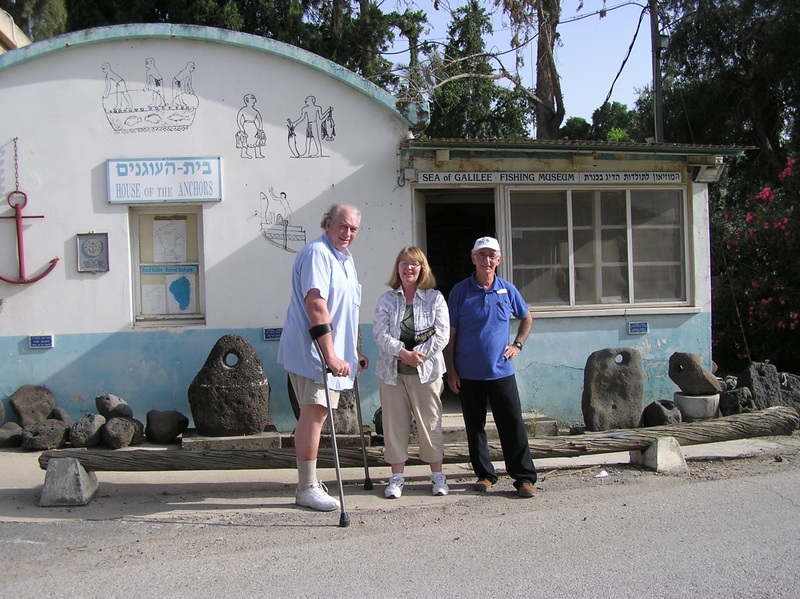 This stop helps visitors understand why the Golan Heights is an important line of defense for the Jewish state and how vulnerable it is. 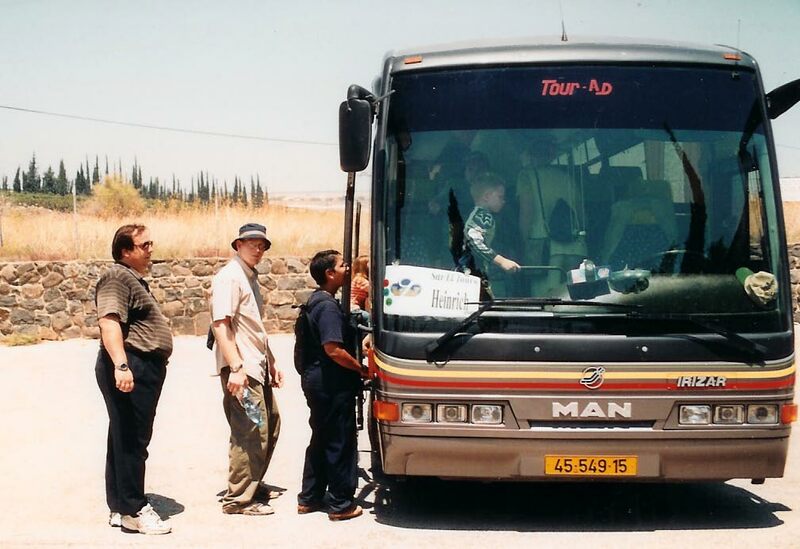 Yes, it is a safe place for tourists or our guide and driver would not be permitted to take us there. Paivi has a love for animals. 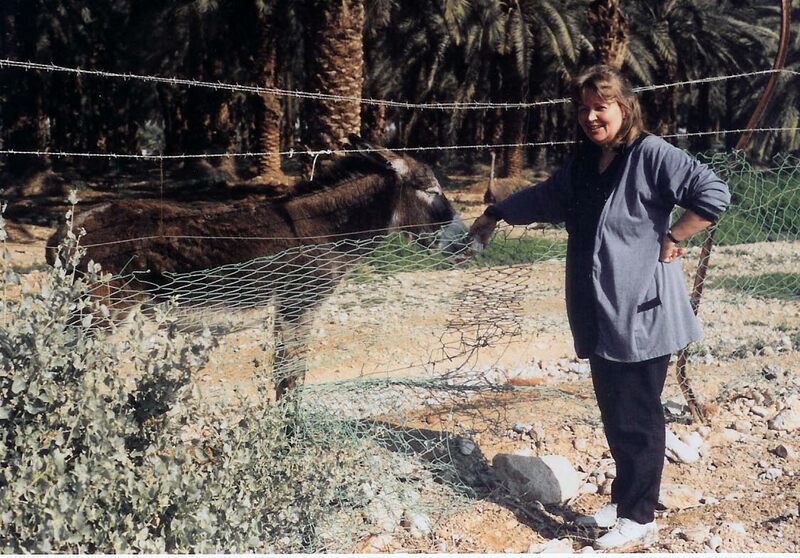 Here she is giving a donkey a treat in a date palm grove near the Dead Sea. 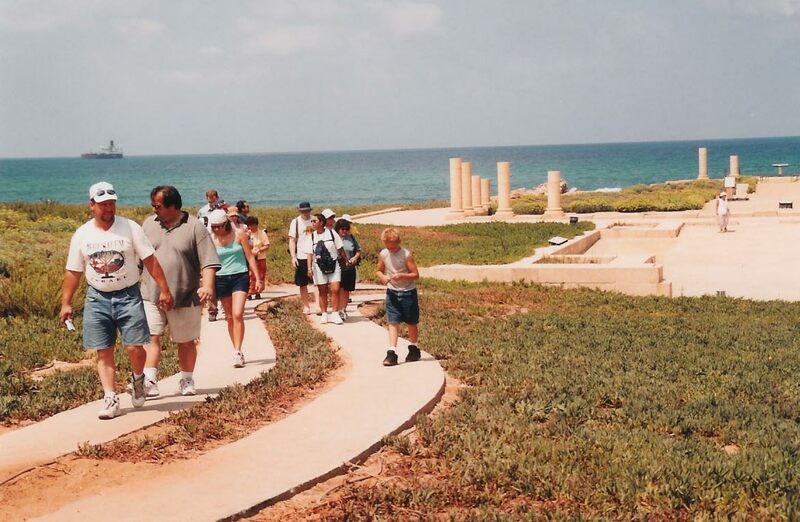 At Caesarea, along the Mediterranean Sea, our group leaves the ruins of Herod’s palace to see the many other architectural wonders he built in this city. 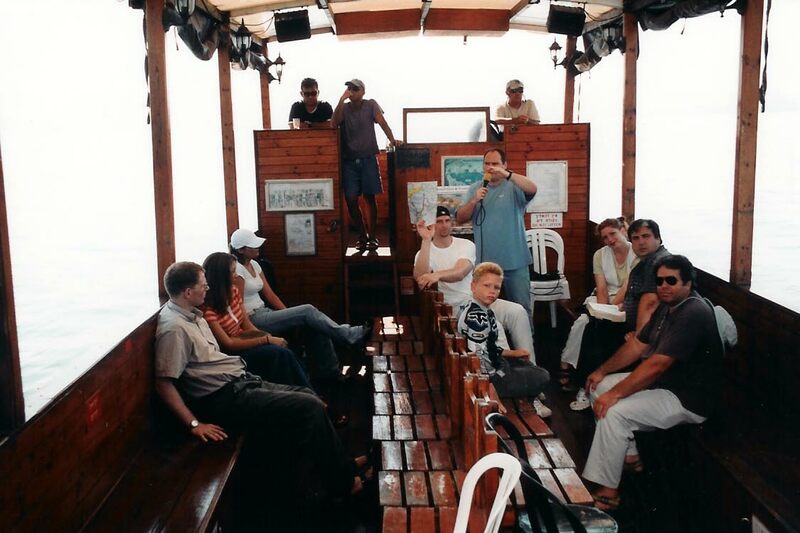 Eretz, our tour guide, presents a teaching while our group enjoys a ride across the Sea of Galilee. 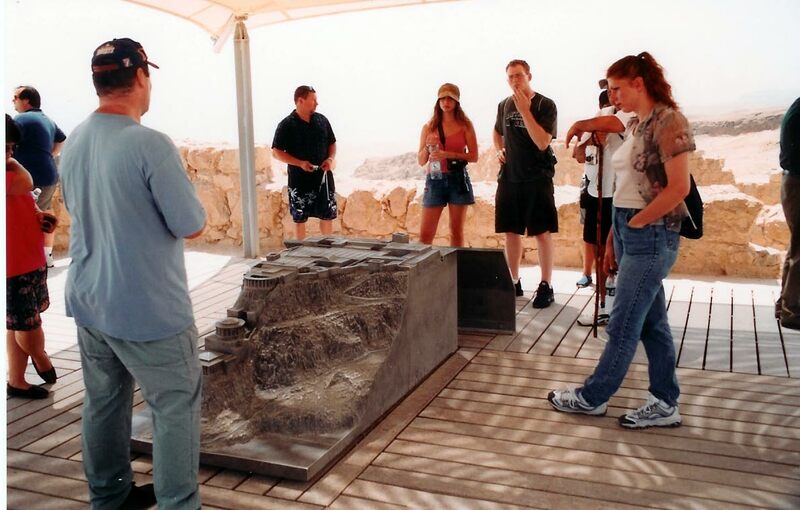 On the top of Masada our guide explains the model of King Herod’s Dead Sea fortress palace. 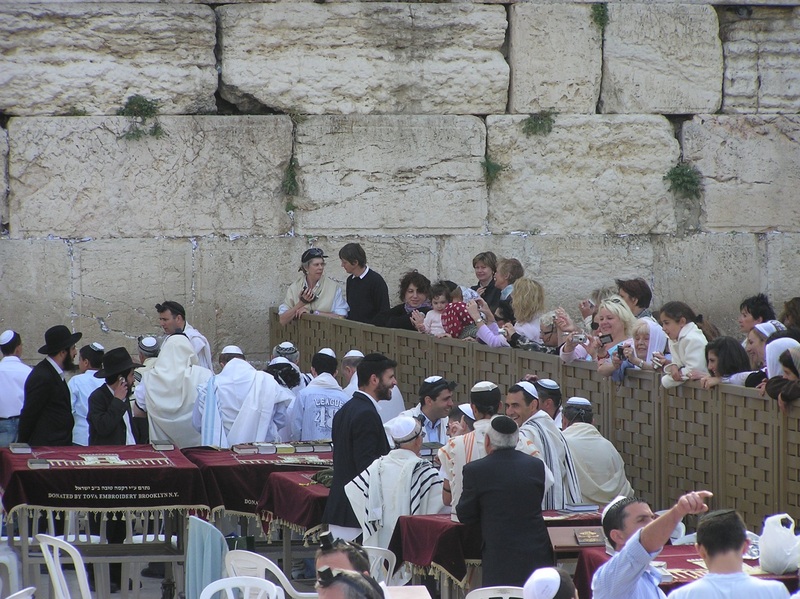 This helps visitors place the historical and cultural environment into perspective. 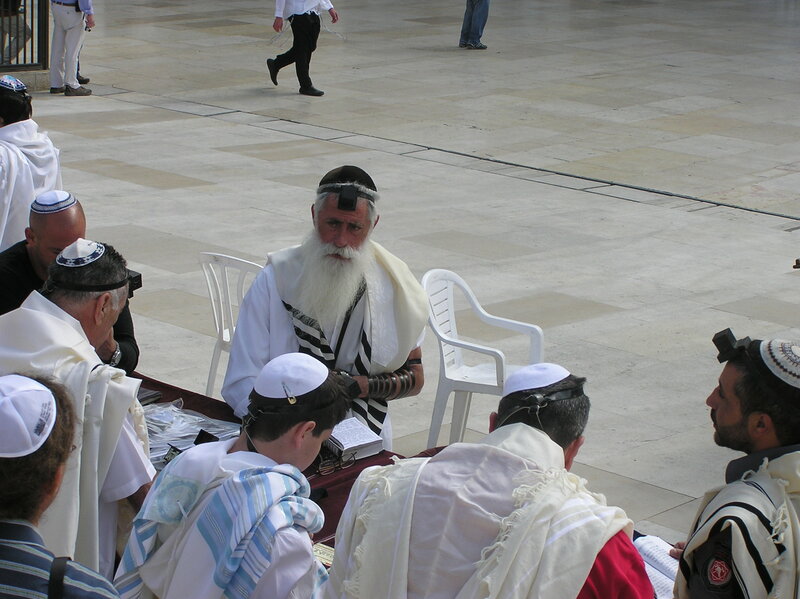 Like lost sheep, our little band finally arrives to where they belong. Sometimes hosting a tour is like operating an adult day care, but it is fun, inspiring, and enlightening. 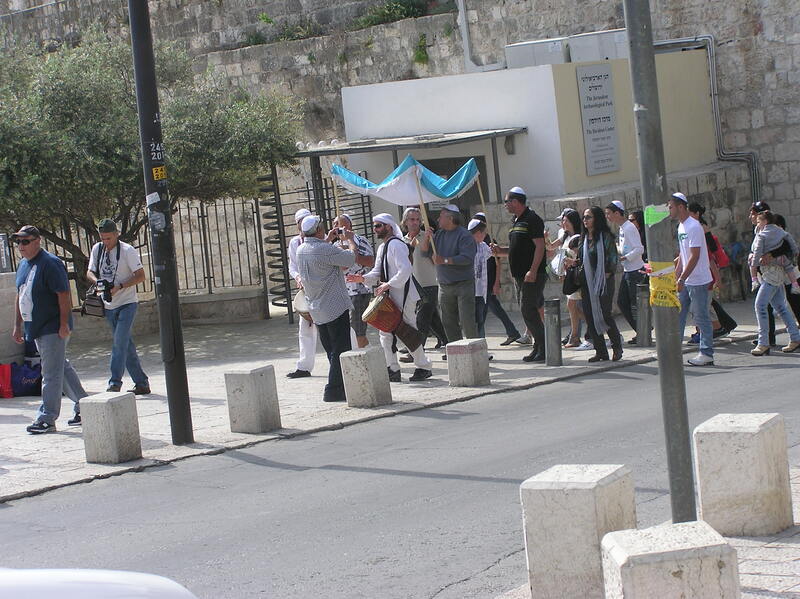 Finally the lost sheep have return to their fold (bus) in preparation to their trip home. 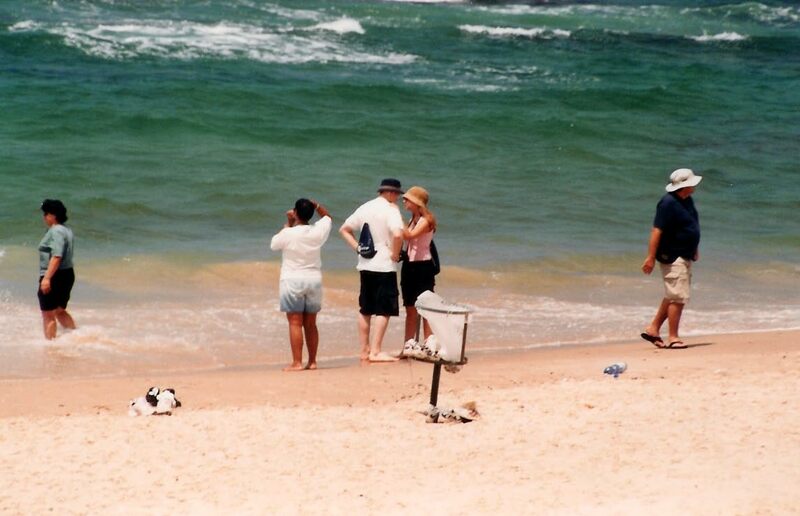 They are looking forward to a return trip with Bill and Paivi.